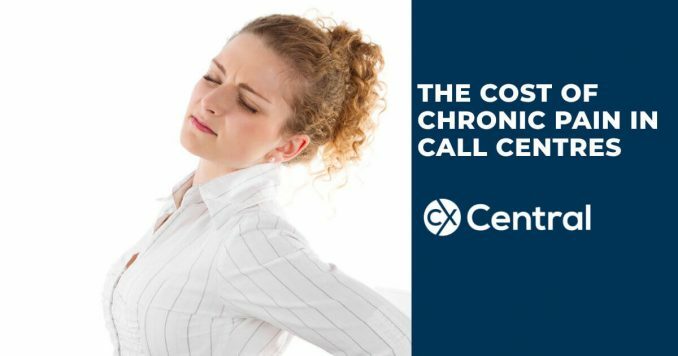 Chronic Pain in Call Centres | How much is it costing you? What comes to mind when you think of injuries that happen at work? Maybe someone dropping a brick on their foot or being run down by a forklift in a warehouse. Or falling or tripping on a building site or perhaps having a car accident. You probably don’t think of computers and offices, and the debilitating pain they can cause. But there are several important reasons we need to appreciate how risky working in a call centre can be for employees. MSD’s (i.e. musculoskeletal disorders) and WRULD (i.e. work-related upper limb disorders or soft tissue injuries) are recognised as the most significant negative health issues associated with the use of personal computers and considered a major contemporary occupational health problem. In my PhD research, I discovered that over 11% of call centre employees suffer chronic pain – pain that doesn’t go away. Research indicates chronic pain cost the Australian economy A$55 billion in 2012. Every health risk factor carries a productivity burden (loss) on average of 2.4%. At an annual wage of around $33,800, this one health risk factor (without considering risks such smoking, lack of exercise, poor diet etc. ), is costing your call centre $810 annually for every employee experiencing chronic pain. If 11% of agents are experiencing chronic pain, the productivity burden for every 100 agents is nearly $9000. And this is while the agent is still at work. Add to this the costs associated with escalating rates of absenteeism, staff turnover and WorkCover claims! On top of that, my PhD revealed over 80% of agents admit to working with some level of pain or discomfort. For employees with pain in their muscles and joints, it can mean struggling to do their best at work, taking sick leave, or leaving the industry. Because these headaches, sore backs and painful shoulders are so common, we’ve come to think they are normal, so employees don’t think to mention it to managers. We already have ergonomic checklists and adjustable equipment (the accepted approach in most call centres) – what more could be done? But with the right approach, many of these aches and pains could be easily prevented and treated. It might sound dramatic, but I can see it coming – a wave of injuries and chronic pain among call centre agents is on its way. There are several unavoidable trends behind this wave. Our ageing workforce and increasingly sedentary work (“sitting is the new smoking”), means more employees are at risk of chronic illness and injuries. These include an increased risk of heart attack and stroke, a range of cancers (including endometrial, breast and prostate cancer), type 2 diabetes, obesity and poor mental health (including depression). Younger agents aren’t safe either. Gen Y (and now Z) employees are reportedly entering the workforce with existing injuries due to high screen use. It’s also increasingly common for agents to work from home, hot-desk, use sit-stand workstations and use multiple screens (including phones). With such a mobile workforce and less control over personal workspaces, how can employers help staff avoid working in awkward static postures? Even when we’re not working, we’re all spending more and more time using screens, without yet understanding how this is adding to our sore neck, back pain, headache or frozen shoulder. How many hot-desk (considered a health risk factor), have snacks at their desks, smoke, stay in the lunchroom instead of walking, carrying a bit too much weight, or look stressed. All these health risk factors have an accumulative adverse health effect, and all are made worse when the person is also suffering from musculoskeletal pain. 1 in 10 of your agents is probably already experiencing chronic pain. This one health risk factor has a significant impact on productivity yet can be substantially reduced with the right self-care (capacity building) skills training. I would love to see this figure decrease so more employees can work at their best – without pain, and your call centre can capitalise on the productivity benefits. Find providers that can help reduce the risk of chronic pain in your call centre in our Business Directory.